From the engine style I think the recovered Z-95 is the Clone variant. Aft end of the fuselage fits as well though the cannons are a little different. 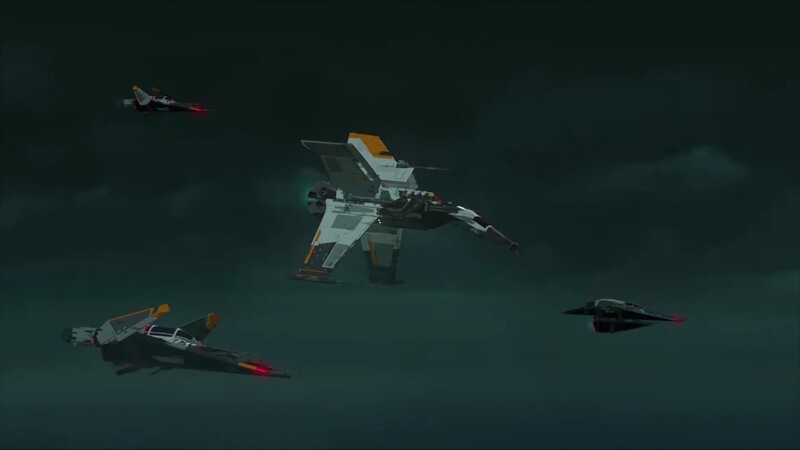 That makes me think that Reaper Squadron was a Clone Pilot squadron. Yeah, the engine seems to match pretty well. Neeku might've been correct.. concept art identifies it as a Z96. Huh! I didn't even notice that after looking at it both here and there. Oh well! Could be, I suppose. Though as Hiemfire mentions, the engine does seem to match the Clone z95. Maybe an intermediate model variant between 95 and the 96? As cool as all this Z-95 and Z-96 was, you know what's even cooler? The sheer heroics Kaz pulled with Griff. Holy crap. Ah yes. The quiet before the Hosnian sized storm. At this point the series is growing on me. Looking forward to this seasons conclusion! Newest episode felt a bit fillery but did give Kaz more evidence about the sorts of things the FO is doing (they needed a device commonly used to break up asteroids). A collection of short videos that have some fun character moments as well as some fun moments with both the Aces and the Fireball. Mmh. Haven't seen it yet. Yeah Kisscartoon hasn't even uploaded last weeks yet, so I'm behind. So far, not super into the first two episodes we've seen since the mid season break. The first one making the reveal about Bibo take so long just made the characters seem really idiotic while even children would pick up on it within the first five minutes or so. Second episode is okay, a bit too high on the physical comedy and Kaz still being an overall idiot but at least he seems to be picking up the basic skills he needs to do his cover job. Based off the title of next weeks episode, and the very short summary I'm guessing we will be getting the pirates attacking the station with their ship with its AT-AT bit and the aces having difficulty fighting them so Doza agrees to let the First Order come and provide 'security'. Art stuff from the official site. 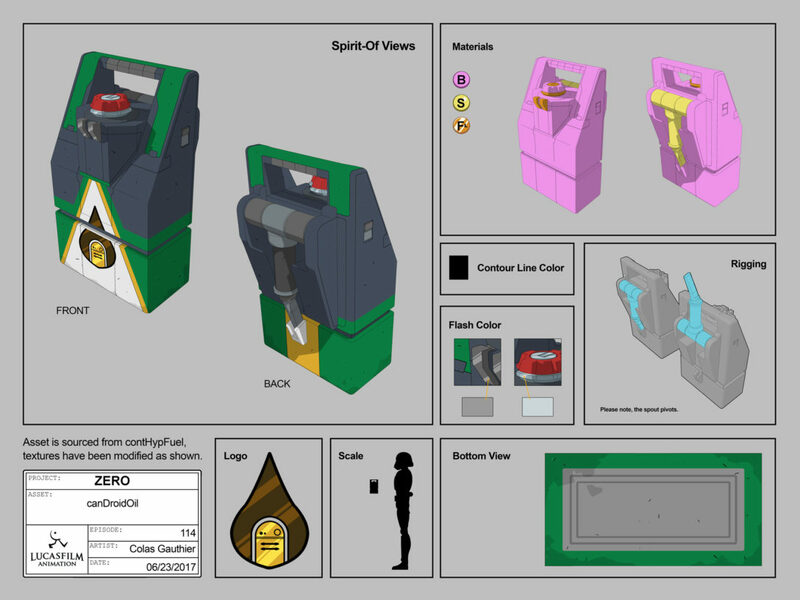 at one point they were working on the Yellow Ace instead of the Fireball, though was changed as the scripting went on but not before they created an asset for it. 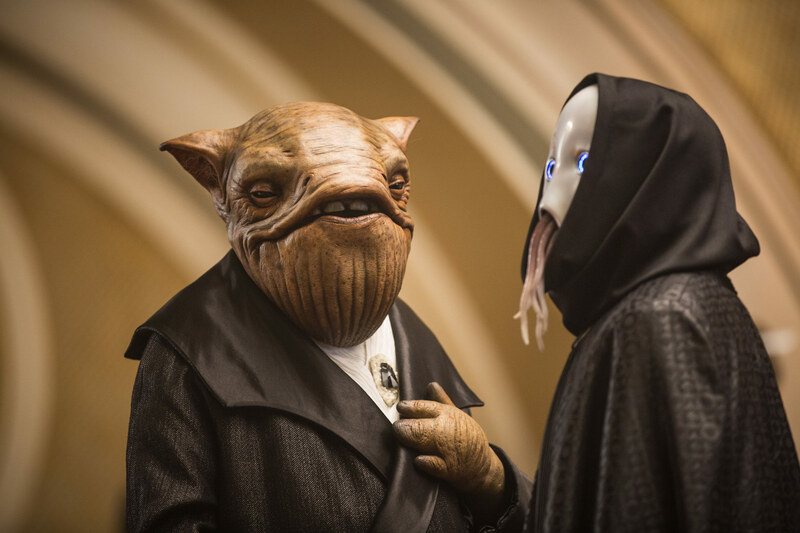 The alien seen in the episode is based on a race seen on Canto Bight in TLJ, for those who haven't seen the episode the one on the left. Isn’t that the Mining Guild Emblum on that ship? It is, a member of the Mining Guild, or someone who claimed to have been part of the Mining Guild was featured in the episode. 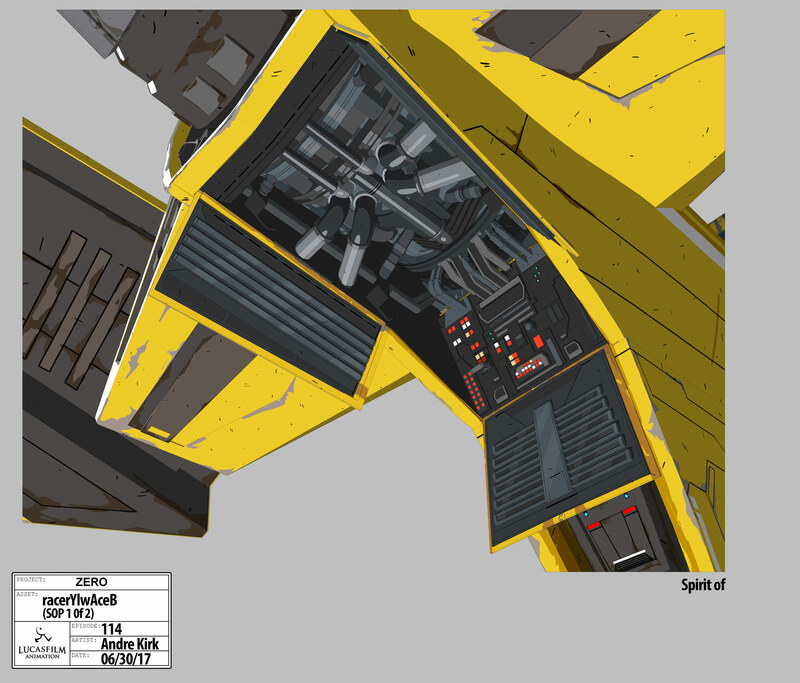 This would make a nice, rudimentary fighter or LRV cockpit. I wonder if this is a YV-series freighter or something inspired by it. The front reminds me of the "flying brick." Trailer for next episode. Certainly seems to imply the station will be attacked again. I wouldn't be surprised if the "something close" to Captain Doza is Torra Doza. Most recent episode felt really predictable. I feel like they shoehorned this story a bit. If Captain Doza sees the FO rescue as legit without questioning how quickly they got there than that's going to bug me. I know the show is aimed primarily at a younger audience but kids aren't always so ridiculously naive. A realistic story is still better than one that pretends like kids are dumb. And here is the pirate ship, pretty safe to say they have been operating on the planet during their attacks on the station. And not just predictable but easy to pick out their intended 'twist' so much so that any kid could likely pick it out within the first five minutes of the episode. You'd think that at the very least that Torra would find it really suspicious how the FO was there seeming to pay off the pirates just as she got there, there wasn't any time for them to send out a ransom and the pirates weren't even on edge until after they started getting shot. ****, the aft is a fair bit longer than my earlier estimates accounted for. Definitely an early Empire AT-AT, the one from Rebels, cockpit though on the top. Going from a 1.8m average human height (most likely pilot of the Imperial AT-AT's, to say the Empire was xenophobic is putting things mildly) that piece is 5.85 m wide. Eyeballing it I think the ship, minus prow boom/cannons, is about 13.75 x the width of the AT-AT cockpit, 15 times with the prow bits. So 80.43m not including prow bits, 87.75m with the prow bits. A little smaller than a GR-75. This isn't accounting for possible aspect ratio of the image though (that's outside of my capability). Definitely looks like it. Unless the Galleon has shielding for the landing areas or hidden slide out landing bay doors it looks to be stuck on planet. Still a beautiful ship. Well I liked that episode, because The First Order's plan was friggin' good. Because, here's the thing... It's not to convince Doza. He knows what's up, or at least suspects it. Torra has no idea, but the people of The Colossus? Oh they'll be happy to support the faction that just saved a beloved racer and the station head's daughter.